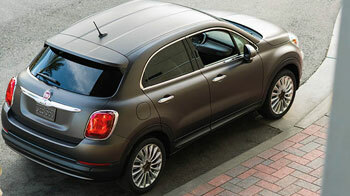 Last year, the Fiat 500X was a newly introduced car. For this reason, people, especially the ones who bought the Fiat 500X last year, have many expectations for the 2017 Fiat 500X. The Fiat brand already has an established audience, but the company strives to improve their vehicles in order to give their loyal fan base a new experience and awe factor each time they introduce another car on the market. For the 2017 trim level lineup, the company has introduced three trim levels, the entry-level Pop, the rugged Trekking, and the sophisticated Lounge. Both the interior and exterior of the vehicle radiate the time and effort the manufacturers put in to design the perfect vehicle. 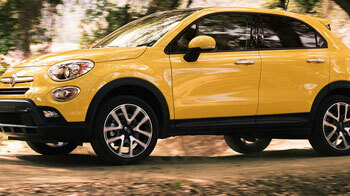 Since the Fiat 500X debuted on the roads, people have begun to overlook its relative the 500L. That is solely due to the car’s elegant and mature styling that magnetizes people as soon as they set their sights on it. Some things most people cannot stop talking about are the car’s neat exterior design, almost perfect proportions, and an excellent handling and driving capability. The Fiat 500X comes in two versions, manual and automatic. The Pop trim and the Lounge trim come with a turbocharged 1.4-liter four-cylinder MultiAir engine. The Trekking trim receives the 2.4-liter Tigershark engine with a nine-speed automatic transmission. The Trekking trim is more expensive than the Pop and Lounge trim due to the Tigershark engine it uses. In fact, the Trekking uses the same engine, as the Jeep Cherokee and the Dodge Dart. If you are searching for a more fuel-efficient car, you should consider the Pop and the Lounge trim. If you want a vehicle with more engine power, the Trekking trim is what you want. The Fiat 500X aims to have drivers see it as a hatchback and urban sedan alternative. Even though the Fiat 500X shares some similarities with the Jeep Renegade, it has done good to set itself apart from the vehicle. Paying ode to its Fiat legacy, the Fiat 500X has taken some styling advice from previous models, keeping with its ancestors’ diminutive shape. Since Fiat 500X wants to be recognized as its own individual brand, the manufacturers have added a different roofline. From the front, the vehicle boasts a chrome grille design with stacked lamps on both sides of the grille. The final addition to the front is its clamshell hood. When you look at the Fiat 500X from the side, the image of an Audi will come to your mind, not that it is a bad thing. The roof of the vehicle lifts up gently above the passengers’ head. 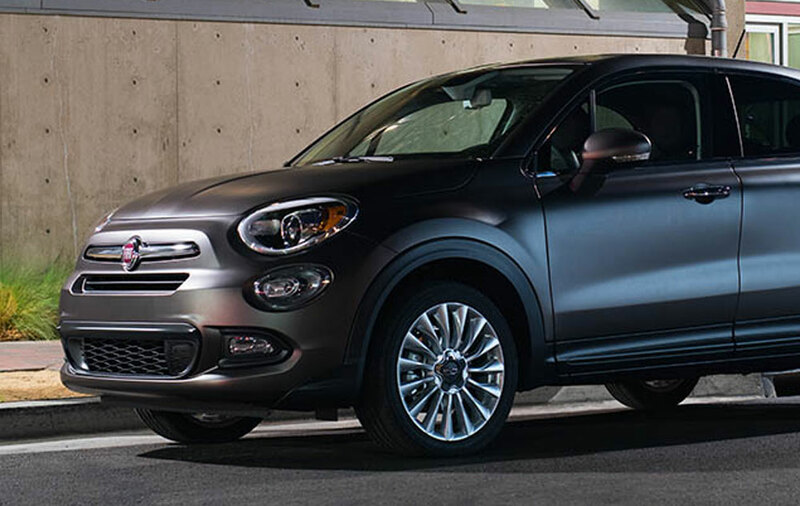 The shape of the Fiat 500X is more like the hatchback shape of the 500L Fiat. It is a complex, long-winded, and an intricate shape. The shape of the Fiat 500X is the reason why the 2017 model looks more mature than its previous model. In short, the best way to describe the shape of the car is that it is—a combination between classy and rugged. Within the trims, you will find a notable difference. The 500X Trekking in comparison to the other two trims has a more distinct front and different wheels. When you look inside the Fiat 500X, you will discover a neat and clean car with large round gauges, complementing the equally round climate controls. The body trim color displays a medium-sized LCD screen, used for camera displays and infotainment. In terms of comfort level, you have another winner on your hands. 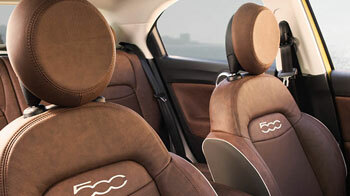 The interior of the vehicle, outfitted with leather seats, is spacious and comfortable. For the passengers sitting in the back, the car offers sufficient leg and head room. Even thought the seats do not fold, the cargo capacity is sufficient due to its low surface and standard shape. You also have the option to order a sun roof. However, the addition of the sun roof may create a problem for tall passengers. 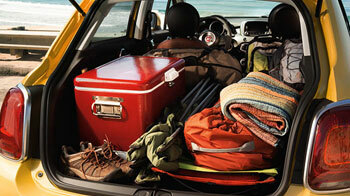 In short, the 500X Fiat offers 18.5 cubic feet space in the rear and 50.8 cubic feet space in the front. People buying the Lounge or Trekking model will be able to adjust the height of the cargo floor in the back that functions with a folding seat. Even though the dashboard of the car is black, people have the option to opt for colorful inserts such as orange or brown. The Pop trim has a manual transmission, manual tilt and telescoping, front wheel drive, capless fuel filler, daytime lights, automatic windows, 16-inch steel wheels, air conditioning, cargo compartment, sun visors, black and white display in the instrument panel, 60/40 spilt seats in the rear, four speaker sound system, and more. The Trekking trim has drive mode selector, fog lights, tinted windows, 17-inch alloy wheels, adjustable trunk surface, color display in the instrument panel, vanity mirrors, sun visors, black cloth seat covers, multi-function steering wheel, six-speaker sound system, five-inch touch screen display, and more. The Lounge trim has 17-inch alloy wheels, interior lighting, automatic dimming rear view mirror, eight way adjustable driver’s seat, eight-speaker sound system, 6.5-inch touch screen display, rearview camera, navigation system, cargo compartment, automatic dual zone air conditioning, and heated front seats. If you want to purchase any of the three trim levels of the 2017 Fiat 500X, you should visit Derrick Dodge. 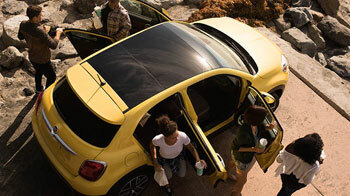 The Fiat 500X is perfect for people looking for a smaller car with sufficient engine power, space, and features. Come in for a test drive to see how it feels like sitting behind the latest Fiat 500X. Test the 2017 Fiat 500x at Derrick Dodge! Whether you’re ready to make a purchase or just curious if this might be the right model for you, take the drive from St. Albert or Sherwood park to get behind the wheel of the 2017 Fiat 500X at Derrick Dodge Chrysler Jeep RAM. Our doors are open to serve you seven days a week, and you can always contact us for more information.